Introduce your family to traditional Italian culture during a one-week stay at a quintessential Tuscan villa outside Florence. You’ll discover medieval and Renaissance gems when you visit Florence, Siena, San Gimignano, and Monteriggioni. Plus, immerse yourself in the culture as you and your kids or grandkids make pizza and gelato with a traditional nonna (grandmother), learn a little Italian, and take a drawing or painting class in the villa’s beautiful gardens. You’re also certain to enjoy all the amenities of your own 14th-century Tuscan villa, including the refreshing pool.​ Recommended for families with children ages 8 and older. Tuscan Villa Stay: Spend six nights at an upscale 14th-century Tuscan villa in the traditional medieval town of Figline Valdarno, near Florence. Here, your family will enjoy traditional culture, good food, and fun family amenities such as indoor and outdoor pools and gardens. Culture and History: Venture to Florence, where you’ll tour the Accademia and Uffizi. Step back in time to a medieval experience in Monteriggioni. And travel through the Tuscan countryside, to the historic towns of Siena and San Gimignano. Hands-on Activities: Take an Italian language class, learn how to make traditional pizza and delectable gelato, and expand your horizons during an art class. These offerings are designed for adults with kids ages 8 and older. Upon arrival in Florence, you will be met by your program manager and transferred to your Tuscan Villa. One airport group transfer will be provided for travelers. We will inform you about specific pick up time. Please book your flights accordingly. If you are arriving outside these dates/times we can provide private airport transfer at the additional cost or you may take a taxi. 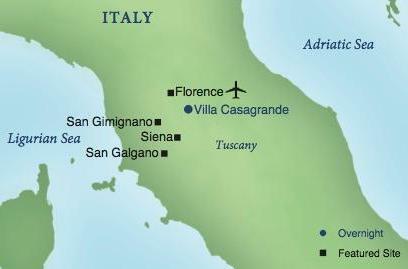 The villa is located in the Tuscan village of Figline Valdarno, less than an hour from Florence. In the afternoon, enjoy an Italian language lesson and tour of your Tuscan village. Set off for a full-day excursion to explore the quintessential Tuscan towns of Siena and San Gimignano, another World Heritage site. On your walking tour of Siena, you’ll see the Piazza del Campo and the local Duomo and learn about the vibrant history of this town. Enjoy a light lunch on your own, then travel to San Gimignano. Adults and children alike will easily imagine life in the Middle Ages, when such fortified hill towns also served as fortresses. During a walking tour, examine the thick protective city walls and view the remaining 13 watchtowers (from the original 76 towers), which reflect the power and prosperity of the city’s families. Enjoy a leisurely breakfast at the villa then go on a culinary adventure. First, you’ll learn about gelato culture at Pasticceria Fabbrini. Open since 1938, this sweet shop is famous for the production of pastry and handmade ice cream. Learn how to craft pastry, ice cream, and frozen desserts using ancient Tuscan techniques and then taste the fruit of your labor! Florence is a historic jewel and World Heritage site—where the Renaissance spirit and genius flourished and famous figures such as Dante, Giotto, Leonardo da Vinci, Raphael, and Michelangelo walked the cobblestone streets. During a morning walking tour, learn about its history as you view many of its main piazzas, streets, churches, and palaces. Your local guide provides additional insight as you visit the Duomo and its Campanile and Baptistry, the Church of Santa Croce with the tomb of Michelangelo, and the Accademia, home to Michelangelo’s famous David. Today step back into medieval times with a full-day experience in Monteriggioni and San Galgano. Completed in 1219, the medieval castle here is the most well-preserved in the province. You and your family will have the opportunity to wear medieval armor and costumes, walk the defensive walls and keep watch on the town below from the high towers. After a leisurely lunch in town, travel to San Galgano to see the historic abbey and tomb of Saint Galgano, home to the Italian version of the legendary “Sword and the Stone” tale. Start your day with another wonderful breakfast at the villa. Then the entire family can participate in a hands-on art program. Enjoy an art class in the beautiful garden of Villa Casagrande or in the main square of Figline Valdarno. You’ll learn how to create art en plein air style, or outdoors, and will have the opportunity to choose and practice various drawing and painting techniques with a local artist, using graphite, charcoal, pastel, watercolor, or acrylic. After you’ve created your masterpiece, spend the afternoon at the pool, spa, or taking one last stroll through the picturesque village.